In recognition of their outstanding contributions to the Pharmacy profession, Pharmaceutical industry and support to the National Agency for Food and Drug, Administration and Control (NAFDAC) in ensuring access to safe, efficacious and affordable medicines in Nigeria, the President, Nigeria Academy of Pharmacy (NAPharm) Prince Julius Adelusi-Adeluyi, and the Immediate Past President (IPP) of the Pharmaceutical Society of Nigeria (PSN) Pharm. Ahmed I Yakasai, have been decorated with Legacy Award by NAFDAC. L-R: Yobe State Governor Ibrahim Gaidam; the Immediate Past President (IPP) of the Pharmaceutical Society of Nigeria (PSN) Pharm. 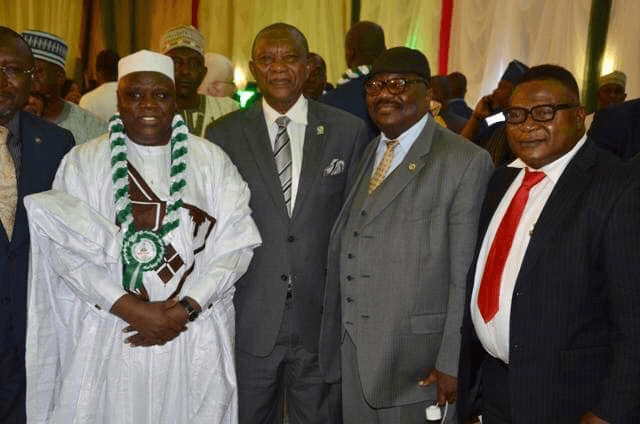 Ahmed I Yakasai and wife, Mrs Khalisa Yakasai; and the President, Nigeria Academy of Pharmacy (NAPharm) Prince Julius Adelusi-Adeluyi (right) at the occasion. 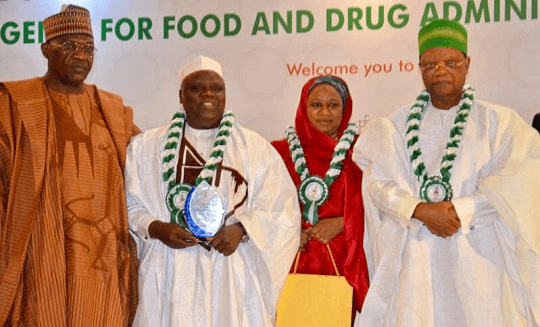 The award presentation took place at the Silver Jubilee celebration of NAFDAC, on 26 March 2019, at Banquet Hall, Presidential Villa, Aso Rock, Abuja. Also on the Legacy category list were Late Ambasador (Pharm.) Tanimu Saulawa; Juhel Pharmaceuticals and Drugfield Pharmaceuticals. L-R: The Immediate Past President (IPP) of the Pharmaceutical Society of Nigeria (PSN) Pharm. Ahmed I Yakasai; PSN President, Pharm. (Mazi) Sam Ohuabunwa; Mr Isama Tony Isama, special adviser to the senate president and the National Secretary, PSN, Pharm. Emeka Duru at the occasion. Expressing his profound gratitude to the management of the agency, for conferring such noble award on him, Yakasai, via his Facebook page said he cannot thank NAFDAC enough for the great recognition. He said :”I must express my sincere appreciation to Gen. Waqar Ahmad Kingravi, High Commissioner of Pakistan, PSN President, Pharm. (Mazi) Sam Ohuabunwa; NMA President, Dr Francis Faduyile; NAE Mohammed, Registrar, PCN; APBN President represented by Dr Omede Idris; MD, GSK, Mr Bhushan; Managing Director, WWCVL, Mr Santosh Kumar; Dr Njide Ndili, country representative, PharmAccess; Mr Mahe Abubakar, DMD, Jaiz Bank; Kabiru M Adamu, MD, Agric Bank; Pharm. Emmanuel Abolo, Dean Rova College; Dr Omokhudu Idogho, MD, SFH; ACP Baba Mohammed; Mr Tony Isama; friends, family members and professional colleagues for been with me on this great occasion”.